In its December 15, 2014 issue, Sports Illustrated features pitcher Madison Bumgarner of the San Francisco Giants as the Sportsman of the Year. Bumgarner was the Most Valuable Player in the World Series this year, going 2-0 with a shutout, a save, and an earned run average of 0.43. In the postseason, he was 4-1, struck out 45 batters, and had a 1.03 ERA. Given Bumgarner’s performance, it would be difficult for anyone to argue with Sports Illustrated for their selection. Verducci’s claim–and he isn’t the first to make it–is based primarily on one statistic: Bumgarner’s career ERA of 0.25, which is the lowest of any pitcher with at least 30 innings in World Series competition. To have the lowest ERA of any pitcher in the history of the World Series is very impressive, as is his 4-0 record. But does that make him the greatest pitcher in World Series history? Not by a long shot. And it’s not even close. A line from Verducci’s article provides the explanation of how he and many other baseball experts jumped to the misguided conclusion that Bumgarner is the greatest pitcher in the history of the World Series. Verducci writes, “His (Bumgarner’s) performance this year is the stuff of instant legend.” And that’s the problem; the term “instant legend” is an oxymoron. Without time, there can be no legend. If not Bumgarner, then who? Here’s the thing. It really doesn’t take much effort or research to dispel the myth that Bumgarner is the greatest pitcher in the history of the World Series. There are at least four pitchers whose performance in a single World Series was more impressive than Bumgarner’s career record. I contend that Mickey Lolich, Bob Gibson, Lew Burdette, and Christy Mathewson all were greater pitchers in the World Series than Bumgarner. 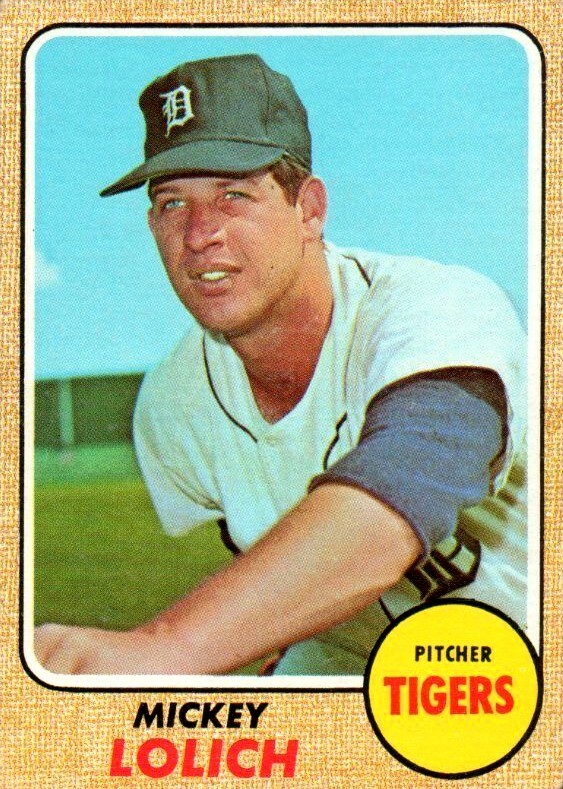 In 1968, Mickey Lolich led the Detroit Tigers back from a three-games-to-one deficit against the St. Louis Cardinals. After the Tigers dropped the opening game of the Series, Lolich pitched a complete game and earned the win in Game 2. The Cardinals won the next two games and headed back home to St. Louis needing to win only one more game to wrap up the Series. Lolich pitched another complete game in Game 5 to keep the Tigers’ hopes alive and they evened the Series by winning Game 6 behind 31-game winner Denny McLain. Then on only two days’ rest, Lolich earned his third win of the Series by pitching another complete game. Lolich’s ERA for the Series was 1.67 as compared to Bumgarner’s 0.43 in this year’s Series, but there is no question that Lolich’s overall performance was much more impressive. And it’s not even close. 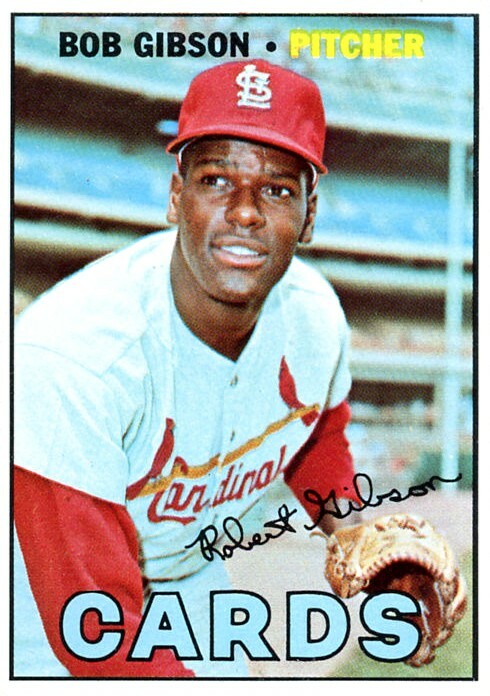 In 1967, Bob Gibson was 3-0 with three complete games and a shutout against the Boston Red Sox; he also hit a home run in Game 7. In 27 innings, Gibson limited the Red Sox to just 14 hits and he struck out 26 batters. His ERA was 1.00–again, higher than Bumgarner’s in this year’s Series–but Gibson’s overall performance was easily more impressive. 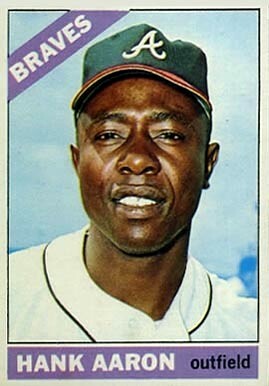 From a career perspective, Gibson also pitched in the World Series in 1964 and 1968. Had he received more offensive and defensive support in Game 7 in 1968, he likely would have had consecutive Series with three wins. He lost Game 7 to Lolich and the Tigers when center fielder Curt Flood misplayed a fly ball in the top of the seventh inning that led to three runs. The Cardinals managed only one run against Lolich, so Gibson took the loss. For the Series, he pitched 27 innings, allowed only 18 hits, and struck out 35 batters. In possibly the most dominating single-game performance in World Series history, Gibson struck out 17 batters in his shutout in Game 1. Gibson was 2-1 in the 1964 World Series against the New York Yankees with two complete games, 27 innings pitched, and 31 strikeouts. Even with two World Series losses in his career, Gibson was a much better pitcher in the Fall Classic than Bumgarner has been. And again, it’s not even close. 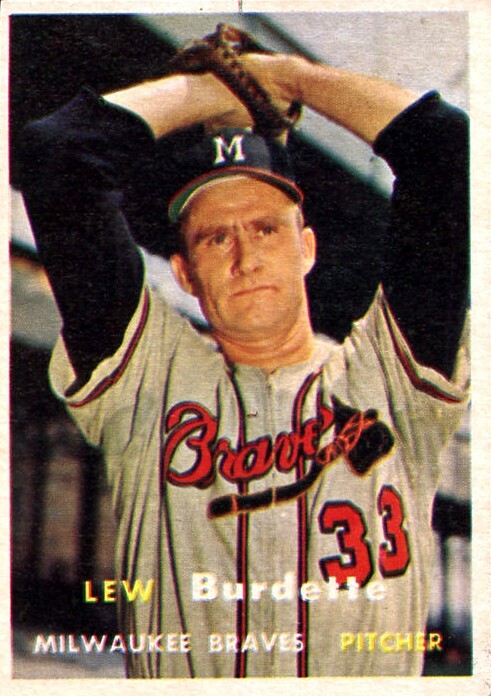 In 1957, Lew Burdette was 3-0 with three complete games and two shutouts against the Yankees. Burdette was not a power pitcher, so he only had 13 strikeouts in the three games, but that takes nothing away from his dominance. He gave up single runs in the second and third innings of Game 2 and then tossed 24 consecutive scoreless innings en route to winning Games 5 and 7. Burdette’s 0.67 ERA is higher than Bumgarner’s 0.43 in this year’s Series, but there is no question that Burdette was more dominant. If Verducci and the instant-legend crowd want to disqualify Burdette for comparison against Bumgarner as the greatest pitcher in the history of the World Series because Burdette was 1-2 with a 5.64 ERA in the Series the following season, then so be it. But I maintain that Burdette’s 1957 performance gives him the nod over Bumgarner anyway. And again, it’s not even close. Any argument over who was the greatest pitcher in World Series history begins and ends with Christy Mathewson. Matty. Big Six. In the 1905 World Series, the New York Giants beat the Philadelphia Athletics in five games and Mathewson won three of them. That’s right; Mathewson won three games in a five-game Series. Not only did Matty win three games, he pitched three shutouts. That’s three starts, three complete games, three shutouts. That’s an ERA of 0.00. Big Six pitched 27 innings and gave up just 13 hits. I don’t think even Joe Buck, who stopped just short of saying Bumgarner walked on water from the bullpen to the pitcher’s mound in Game 7 of this year’s Series, would argue that Mathewson had the greatest single pitching performance in World Series history. 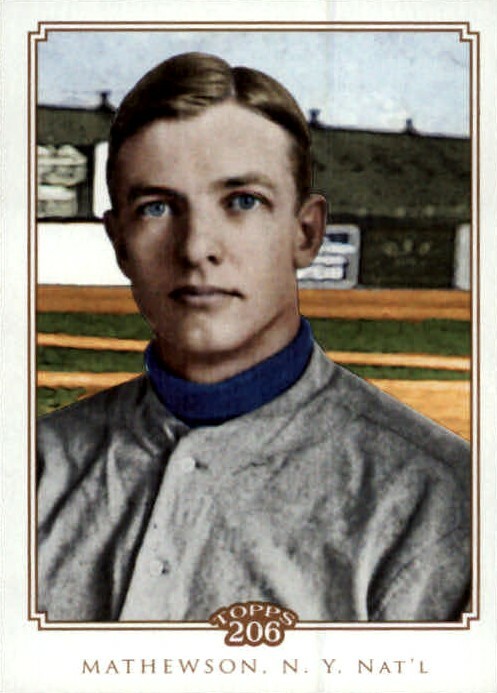 Mathewson appeared in four Fall Classics; after 1905, he was with the Giants for the World Series in 1911, 1912, and 1913. Even though his record in his final three World Series is 2-5, he still pitched very effectively. He completed 10 of his 11 World Series starts and his ERA in 101 2/3 innings pitched is 0.97. Given his performance in 1905 and the quality of his overall volume of work, Mathewson was a better pitcher in the World Series than Bumgarner has been. And for the fourth time, it’s not even close. Nowhere in Verducci’s Sportsman of the Year article does he point out that Bumgarner’s performance in the World Series this year came at the expense of the team with the fourth-best record in the American League. The Kansas City Royals finished the season with a record of 89-73. Lorenzo Cain led the team with a .301 batting average and Alex Gordon was tops in home runs with 19 and runs batted in with 74. The Royals were a decent team, but the ’27 Yankees they were not. In the years that Mathewson, Burdette, Gibson, and Lolich had their phenomenal World Series performances, they faced the team with the best record from the opposing league. It’s not Bumgarner’s fault that the Los Angeles Angels didn’t make it to the World Series, but his pitching line may have been a whole lot different against the best team from the American League. In fact, Bumgarner’s entire World Series career has come against teams that did not come close to having the best record in the league. In 2012, Bumgarner appeared in one game, pitched seven shutout innings, and got the win. His opponents that year, the Detroit Tigers, won 88 games and had the fifth-best record in the American League. 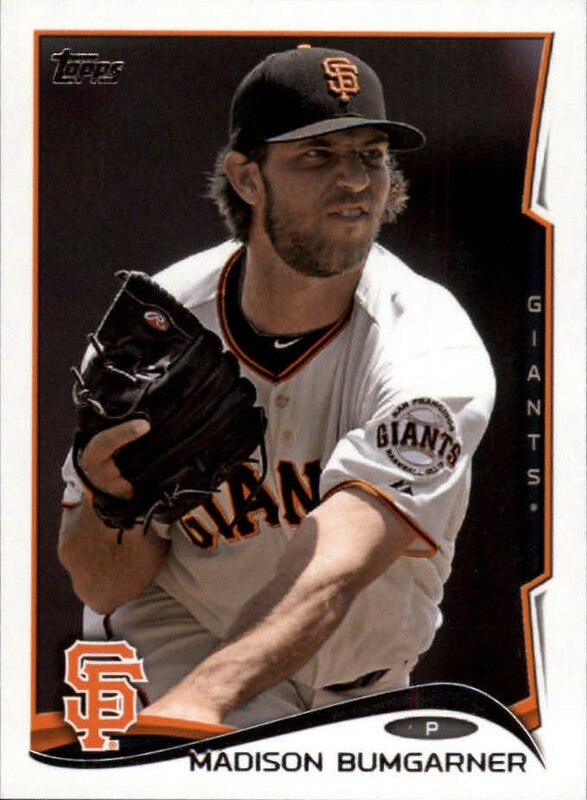 In 2010, Bumgarner appeared in one game, pitched eight shutout innings, and got the win. 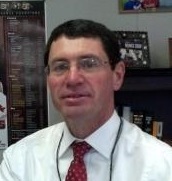 His opponents that year, the Texas Rangers, won 90 games and had the fourth-best record in the American League. Time is an essential element when deciding whether or not someone’s deeds are legendary. That’s why, no matter how many people claim to have seen one, the “instant legend” is just a myth. Curt Flood. Haven’t thought of him in a while. Carl hated him, said he ruined baseball. Flood refused to report to Philadelphia, sued baseball and lost, tried a comeback with the Senators in 1971, and was out of baseball at age 33. He died of cancer before he was 60. Carl probably isn’t alone, but Flood’s contribution to free agency was largely symbolic. These are compelling arguments…can’t say I disagree. People will acknowledge that a song is great when it has elements of entertainment and quality of rhythm. look for online Tamil songs.